After another hugely successful absence... (to paraphrase an old Sisters of Mercy advert). 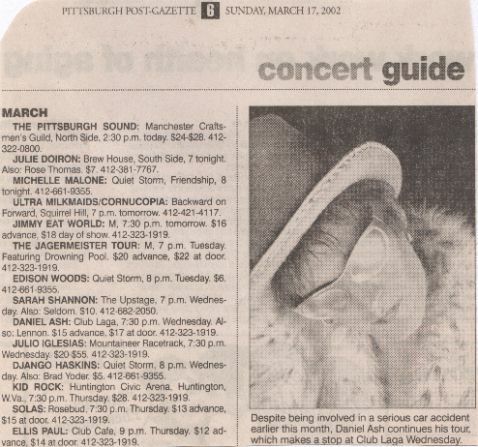 I did have a ticket for the Bauhaus "Resurrection" tour in 1998, in Cleveland, but for some reason, I didn't go. Probably, something I'll long regret. I didn't know about the Love and Rockets breakup in 1999, until many months later, when I read about it on the web. I had noticed that I hadn't heard much about them for awhile after the Lift album, (which I wasn't too crazy about). I was so involved with other music, and my Richey Edwards website, plus, I had stopped listening to the radio and reading American music magazines in the early 1990s, and with the demise of MTV's 120 minutes - I missed any news about L&R. I also started missing Danny's solo work. I found the danielash.org website in June 2001, and put myself on its mailing list. 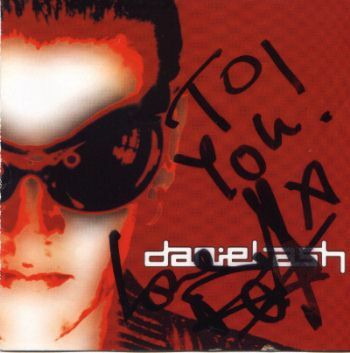 I ordered the Daniel Ash CD from the site, and received one of the (supposedly) autographed copies. (I wasn't sure that was Danny's autograph - it looked like just a scribble.) At first, I wasn't thrilled with a lot of the songs, but it kind of grew on me. The two days before Danny's solo show in Pittsburgh, I was stay-in-bed-all-day depressed, but I pulled myself together for the show, with the memory of Danny's kindness six years before and of how much I used to love him. Before and during the support act, I met two nice people at Club Laga - Lucy and Rich. They ended up standing, one on either side of me, at the edge of the stage, right in front of Danny. Encore - Ok This Is The Pops/Go! I'd never been at the edge of the stage for any show before. I could see the set list taped to the floor. I had a place to put my leather jacket (on the stage). I could see everything Danny was doing - no one was in front of me. I could have reached out and touched the man, if I wanted to. And I knew Danny saw me - especially since he took his shades off for most of the show. The down side was that the dry ice smoke was coming up through vents in the stage floor - right in front of us. We spent half the show waving smoke away from our faces. And Danny did come out, after changing his clothes - from the silver pants/silver and black top outfit, to all black. When he saw me and my friends, he said he had seen us in front of the stage. I told Danny that he was my second favourite music person. He replied, "Only second, who's first?" I told him Richey Edwards, and then we talked a bit about him, since he said he had read a bit about Richey's disappearance. He asked what I thought happened to Richey. (I feel bad now about calling poor Danny my second favourite. But during the years since Love and Rockets were a big deal, I'd moved on. And this night, I was faced with the return of an old love. Now, I'd say it's at least a tie. But it isn't really fair to compare a living person with a legend who is long gone and never to return, anyway.) I apologised to Danny for trying to squeeze the life out of him the last time I met him. He didn't remember that (I didn't expect him to), and waved it off. I asked for another hug, and got it. Then he paid attention to the other people. I didn't hear it, but apparently Danny asked for a good place to go afterwards, and Rich said to go to the Lava Lounge in South Side. So, Rich drove me down there. Originally, Rich didn't want to go in, so we parked by the corner, just to see Danny walk into the bar. I convinced Rich that we should go in for a least a few minutes. Some of Danny's entourage were in the front section of the place, but Danny was in the back, listening to the band that was playing. He told me to sit down across the table from him, so I did. I noticed that it looked like someone was sitting there already, and he said it was only Chris, his manager, and that I didn't have to move. (Chris gave me a dirty look when he came back and found me sitting in his spot. Hey, it wasn't my fault - blame Danny!) I didn't get a chance to say much to Danny, the music was too loud, and he seemed to be intently listening to it. I tried a few times between songs to make conversation, but I soon gave up. (Or maybe, he just wanted to sit quietly.) So, I sat there and watched him drink his wine, and smoke his cigarettes, while I drank my beer. After awhile, Danny got up, and asked me to watch his coat (that long, black leather coat). When I told Rich what Danny had said to me, he said Danny liked me. I told Rich I had just been asked to watch the man's coat, not really a big deal. When Danny came back, he gave me a thumbs up when he saw his coat was still there. He was leaving the city at 9 the next morning, (he had told me that earlier), so he put on his coat, and went to leave the club. Since Rich was driving me home, and he said he'd only wanted to have one drink, which was finished, we started to leave also. (Unfortunately, I wasn't careful enough when I grabbed my jacket, and I lost my $40 monthly bus pass when it fell out of a pocket!) We found Danny by the front door. I told him I'd see him in Buffalo the following week. (I had pretty much decided to see another show, and Buffalo was the nearest one.) I had a momentary lapse of reason, and told him, "I just love you to pieces," and grabbed his hand - his sore hand. (Sorry!) I hugged him again, and gave him a kiss on his cheek, which he returned. When I got home, I could still smell whatever fragrant stuff Danny was wearing, on me, for the rest of the night. Copyright © 2002, 2003 Vivian Campbell. All rights reserved.